This letter is being published openly in the hope that someone may come forward with the missing word to solve what has been a great puzzle for me. I am writing to you in the great hope that you can provide a missing piece of the puzzle I have been trying to solve for many years. As you know, I have been working under the name Social Science and this is a particularly exciting time with the realization of a musical vision I have held for a long, long time. So of course in these troubled times, it’s not enough to simply create a work of art. Unless I can clearly communicate who I am and what I am saying it’s not going to reach the people I am trying to reach out to. So clarifying core values and messaging has been a significant focus. I feel a lot of it is getting quite succinct but the issue is that when I use the word Social the expectation is that I am describing the relationship from one person to another. I am, but this is a secondary focus for me. My primary focus is all about exploring who we are at our core, how we all perceive the same world differently and looking at how we work – often acting on patterns of behavior of which we are largely unconscious. I need to find a word to describe each person’s relationship to themselves – their inside world. Somewhere between psychology, philosophy and the secular, ethical aspects of religion. Ideally it is one word, maybe two. It needs to be able to clearly communicate to an audience of any age. Any thoughts will be seriously appreciated. 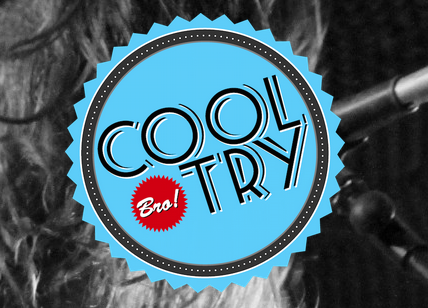 Really enjoyed the interview with Cool Try Bro, an independent music blog from Australia. It was a great experience, exploring my latest projects including upcoming releases. Last Thursday I did a photo session. We shot 500+ photos. Pretty much the last photo of the day was this one. I was standing still but moving my sticks. In the light the camera captured the motion blur of the sticks moving. When I saw it, I was completely blown away. I am seeing the image of a bird taking flight. As the very wonderful 'Flight of the Conchords' say - 'sometimes you see what you want to see' and I might be totally making this up, however this image will be in my mind every time I play with 2 sticks from now till I die. I've been working hard on some new vids to articulate WTF is Social Science in a nutshell. It truly is such a challenging process, I'm trying to put these concepts which I feel so strongly about into the most clear and concise words possible. With this video I'm really starting to feel positive about this as a starting point. Be sure to keep your eyes and ears open for the next edit with some enticing cutaways to other videos from my previous Social Science project. I don’t exactly know what the record for not posting is. I do notice the last post before this was…..wow, almost a year. This is not due to mucking around – I have been so entirely focused on creating new work that I haven’t had the brainspace to be posting during the process. This note is just to say; I’m back! And totally looking forward to sharing my new adventures and taking you along for the journey. From where I have been sitting – it’s all rather exciting. Lots of fun speaking to the very lovely Cris and Alysia. They do wonderful work supporting indie artists. Just posted on youtube a lesson/demo of what I have discovered so far in my investigation using 4 sticks on the drum kit. Goodness me, what an adventure. I had some mighty wrestles with (non-drumming) technology to make this happen. Tell you what is worse than a gadget not working – when a gadget works intermittently. Operational just enough to show you that you can’t do without it, then won’t turn on for 3 days. Aaaargggghh! Still, I am pleased this is up. It’s been a very worthwhile exploration and I am convinced it has merit. If you would like, pop over to the videos page and check it out. It doesn’t matter if you are not a drummer. I would suggest 4 chopsticks or perhaps even 4 pencils would be a great way to start exploring this interesting topic while at the same time annoying those around you. That’s a win/win isn’t it? OK. Let’s dive into it. My big thing – the phrase in my mind which best expresses my vision is Rock Opera. I have concerns about this being misinterpreted as musical theatre. I am talking music with story and theatrical techniques. So in 2009 I had recorded the tracks for this EP ‘Experiment’. I wanted to be able to show you what was in my mind. I didn’t want the vision to be constrained by budget. So we launched into storyboarding. The brief was – “what if I had a hundred million dollars and a year to live?” Initially, the stories were not intended to be related. A series of 5 video clips. As the process evolved, a suggestion came from the writing team to connect the first and last of the 5 videos which was so brilliant it had to make it in. So early on in the adventure, in 2009, I went looking on elance for illustrators. I found Jeremiah Wallis. For me it has been one of the first experiences of having a complete, intense working relationship without ever having met face to face. I know in these modern times that is not wildly remarkable, however I still find it amazing I have someone on the other side of the world I have never met who I would truly call a friend. Jeremiah has an uncanny ability to read between the lines to create some cinematic flavoured masterpieces. I would call him a truly noble human being as well as a seriously fine illustrator. The very talented Tom Spiers did some sensational work adding animation to Jeremiah’s still frames to bring you these animations. During this adventure and the my favourite advance in technology – skype – I had the privelidge of working with some great writers and great people from all over the world in developing the scripts for these videos. I must particularly thank Rivka Willick – a remarkable woman; storyteller, life coach, saint. Broken was written in some of the darkest days of my life. My aim was to bring into sound what it felt like inside on days where the sun didn’t shine in my world. In my younger days, I spent many years playing percussion in the Sydney Youth Orchestra. Some of the peak musical moments etched in my brain are playing onstage at the Sydney Opera House with 100 musicians in front of me and 300 choristers singing their hearts out behind me, and me belting the living heck out of a Bass Drum and Gong. That is good times. So I wanted to draw all possible forces together in this soundtrack for the darkest of times. The 46 piece Northern Beaches Symphonic Wind Ensemble were absolutely wonderful in playing on this track. The Sydney West Singers were very patient in recording all six glorious singers at once, and then doing it again, and again to build a mighty choir. The conductor character in the video, whose rough day we see in Broken, is The Superconductor. I have a very soft spot for a conductor with slightly superhero powers. More adventures in the pipeline. My intention was to create the middle 8 of doom. Please do let me know if you are ever listening to the middle 8 and your lights dim or radio explodes. Life Goes On. The thing for me about troubled times is that they seem so all consuming. When I am feeling rough, sunshine is a long way away. I think the sentiment is best summed up in the blues lyric “The sun is shining, but it’s raining in my heart”. In a way this song is to try and remind myself that all phases are temporary and even though my heart is soggy, the sun is still there above the clouds, about to come out. The opening shot of the zoom out, from the flowers in the field to the solar system is all about perspective. Sometimes I like to think of myself as an ant, among other ants, running around on our busy ness, feeling our errands are so urgent and important. I find it comforting to think that my little dramas are in fact only that. I am playing guitar and singing. The very awesome Jes Stovold is singing b.v’s. The mighty Alex Boneham is doing some pretty amazing work on the double bass. In the nineties, I bought my first car for $50. A 1968 Corona. Glory. A week later, Greg’s mate gave me another for two bottles of wine. Two weeks later we swapped over the gearbox and engine from one to the other and created Lucy the Love Machine. A magnificent car with quarter windows and plenty of style. Now Lucy only had an AM radio. So I started listening to radio where people spoke instead ofplaying music. I stumbled across the channel where they broadcast parliament. I was pretty disgusted with what I was hearing. I was working a lot in schools at the time. I remember thinking over and again that this level of disrespect would never be tolerated in a classroom. The behaviours I was hearing would be displayed in the playground by the bullies and kids who would grow up to sell used cars. It was such a stark contrast to the values that I saw teachers working very hard to instill in our next generation. The values of courtesy, respect, honesty, integrity. So I wrote this song. Never quite got round to releasing it. Although it was originally written for a very different prime minister, I still feel the same way when I look at the political landscape around me. In Australia recently, I have been watching the political upheavals unfold within the ruling party as we head to our next election. I find myself thinking more than ever – please give me someone to believe in. I am developing a quietly skeptical attitude that I may not live to see this wish fulfilled.I have decided to share this in the hope that some people may appreciate the sentiment.